Ooo, What Do YOU Think? For as long as KaBOOM! Comics have published the Adventure Time comic tie-in series (and that’s a few years now!) there have been back-up stories from the Land of Ooo in several issues, created by other comic book writers and illustrators. Well now KaBOOM! (an imprint of BOOM! 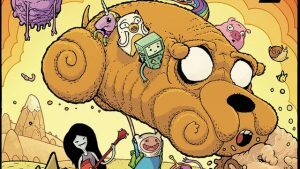 Studios) have made that the main focus of their new full-color Adventure Time Comics series, an anthology featuring three short stories by different creators in each issue. From an article at the A.V. Club: “The first issue of Adventure Time Comics features stories by Gronk’s Katie Cook, Tiny Titans’ Art Baltazar, and Maakies’ Tony Millionaire, with a Nick Pitarra cover homage to Action Comics #1 that spotlights how different artistic sensibilities reinterpret these designs… Future contributors to Adventure Time Comics include Jeffrey Brown, Terry Moore, Kelly Thompson, and Box Brown.” It’s on the shelves now.